I should have posted this earlier, but the complete and utter joy I took in my snow (ice) day on Wednesday got in the way of blogging. Looks a bit different than the link I provided, doesn’t it? I’d been asked about the style/design of that linked quilt with a little trepidation (Mr. C asked with some horror in his voice), and the hopes it wouldn’t be so…busy? I think what we’ve done looks amazing, and even more so in person. 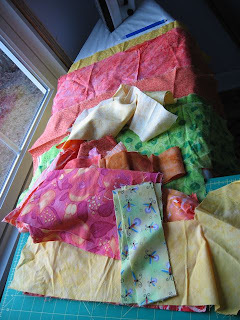 Last night we tied the centers of all the squares to the fantabulous backing, using yellow, orange and green. I’ve taken possession of it for the weekend, and will tie the corners of the squares, too (I think). What we’d really like to do is quilt the yellow border area. In the interest of time, we can’t quilt the squares–there’s just too much area–but maybe we can swing just the yellow? I’ll keep you posted. It seems like every time I start a project, I’m consumed with enthusiasm for it. I can’t imagine ever getting to the point where it is monotonous, annoying or just plain ugly to my eyes. Yet, every single project seems to wither under some sort of super-critical gaze. The ones that make it to FO are the lucky ones–please don’t ask to see the graveyard for the ones that don’t. Now, I know I am faaaar from the only one that does this. We all have UFO piles, and some even have UFO closets (this is something I both admire and fear). I guess what’s bothering me is the fear of the next UFO. I mean, I understand why I might put down a sweater for six months, or a fair isle vest that vexes me, but an infant cardigan?? That takes just hours to finish, instead of days?? It leaves me wondering at my own foibles. Is this habit of not finishing things leaking into my non-knitting life? Has it been painfully noticeable to everyone else for years, but not me? What’s wrong with you feeble brain when you can’t finish a wee cardigan? I actually paused between these two paragraphs for several days. The problem–the gripping fear that I couldn’t manage to make an FO out of a paltry 150 yards of cotton–sat with me for a few days, but I just couldn’t find a way to resolve it. I had been given a chance to spend my knitting time on something other than the wee cardis, and I wasn’t sure I could hack it. Last night, dragging myself home at 10:45 from this new project, I understood it: It was the fear of moving on. One of my co-workers found out on Wednesday that she (finally!) has come up to adopt a child here in the state. Although Connecticut doesn’t use waiting lists, the wait for a child matching her criteria (basic, I assure you) has been, interestingly, about nine months. She meets this little boy on Tuesday, and after all this time will have her deepest wish come through. In response to this, Terry (the maker of Buster’s quilt and a former employee here) suggested we get together and make the Fastest Crib Quilt Ever. Now, when it comes to quilts, I am qualified to do two things (if you’re generous): 1. Iron and 2. Sew a straight line. I can’t pick colors, even in my own wardrobe, and I certainly don’t have any knowledge of quilt design. 1. It is beautiful and vibrant and so very full of good thoughts. (This is a heartening departure from my frequent cursing at knitting). And, using energy and and assembly line-like style we were able to piece 2/3 of the top of the quilt in just 1/2 hours. 2. Just because I’m starting a new project doesn’t mean I will abandon my current WIP. I think I get that, now. But then I remember I’ve knit 1.25 newborn cardigans, and I think that might count as something. I wish I could post pictures of the two, and bask in the glow of seeing my handiwork on the vast and glorious Internets. Unfortunately, I completely forgot this weekend that my camera-to-computer cable isn’t any good. That it so completely slipped my mind kinda worries me. (Since I forgot to take my credit card out of my pocket this morning, I’m looking online to see if I can order one. Must strike while the memory is hot. Or something). Right, the cardi’s. I’ve done the body and one sleeve for Buster, using this yarn & color. Really, I’m not sure on the olive any more. In the store, in the lighting in the store, I was very fond of the lighter and darker greens. In the (lack of) light in my house, I wonder if I’m trying to put my (lack of) color onto my child. As for the other cardi, I’ve just done 2 sleeves so far. 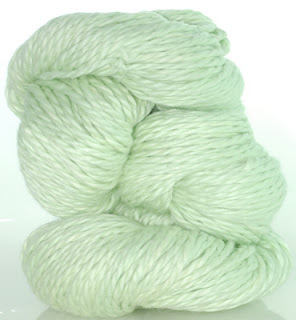 The yarn is delicious to knit with. So, soft, so gentle, I’m tempted to put on my best Long Island accent and invoke a simile of spreadable dairy product. It is that good, I tell you. 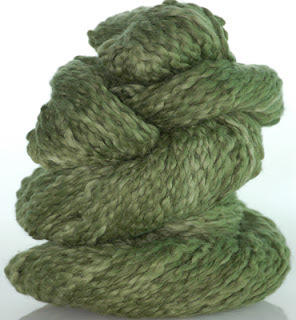 The green I’m using, I think this (my monitor is awful and the yarn is at home), is so much more…I don’t know. Baby. What do you think? I realized that spending so much time on the baby boards (message boards for pregnant women, generally centered around due dates/months) has taken away the coherent thought I used to put into blogging. I’m attempting to wean myself off them, and come back to my home. You people. I realized that leaving a bunny alone for 3 days with no human contact is a bad idea. Especially when a) he’s molting (read: leaving little trails of angora wherever he goes) and b) you think he’s “over” his bad power cord chewing habit. Please don’t ask my husband about the fire behind the sofa. He’s still a bit upset about that.